Love doughnuts? Love bananas? Well then, these banana doughnuts are for you! 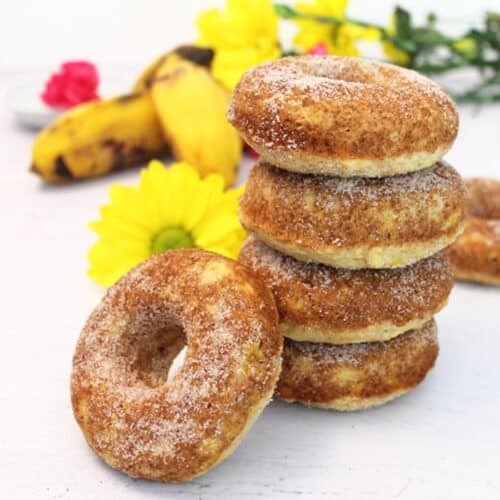 Soft, moist doughnuts reminiscent of banana bread, are baked not fried, then dusted with cinnamon sugar. A healthier option for breakfast or a snack. Preheat oven to 350 degrees. Spray two 6-cavity doughnut pans with nonstick spray. I used one pan & baked them one right after the other. In a medium bowl, mash bananas then stir in vanilla, eggs, vegetable oil and half and half. Pour in the banana mixture into the dry ingredients and stir until well combined. Spoon the batter into the prepared pan(s). Bake for 12 minutes or until toothpick inserted in center comes out clean. Cool for 3 minutes in pan then invert onto wire rack. Immediately dip into cinnamon sugar to coat then allow to cool the remainder of the way. If using the chocolate glaze, heat chocolate chips and butter in a microwave-safe bowl until melted. Heat in 30 second increments, stirring in-between, so that the chocolate stays liquid. Let doughnuts cool slightly then dip tops into chocolate glaze. Allow chocolate to harden then store in airtight container. Doughnuts are best eaten the same day but can be frozen for up to 2 months. If freezing, do not apply the chocolate glaze. Glaze when they have thawed & you are ready to consume.